We play D&D 3.5. 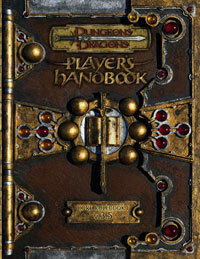 Player characters have access to the Player’s Handbook. The rest of this page lists house rules and exceptions to the default rules. Hitpoints: At the end of the encounter you take a minute or two to catch your breath and you’re back at full hit-points. Scrolls: Once scribed, there is no longer a distinction between arcane and divine spells. If it is on your spell list, you can cast it. Scribing: Automatic spells on gaining a level are free. Copying a spell into your spell book from an existing book or scroll costs 50 gp per spell level and takes one day. Borrowing a spell book to copy a spell without offering a similar spell in return costs an additional 50 gp per spell level. Researching and scribing a new spell costs 100 gp per spell level and takes one week. Either way, scribing a spell requires a Spellcraft check DC 15 + spell level. Spellcasters: Zero level spells are not lost when cast. If a race has access to a certain number of cantrips per day, these cantrips will also be available at-will. Sorcerers of that race add these cantrips as known spells in addition to the number of cantrips they gain due to their class levels. Magic Items: No XP cost when creating them. All non-trivial magic items require interesting quests for material components. Familiar: Replacing a familiar is easy. Any sort of tiny creature can be bound if found and tamed on an adventure. The improved familiar feat is not required. Retraining: On even levels, you can swap a feat for another if you provide a good in-game explanation. On every level, you can move two skill points if you provide a good in-game explanation. On every level you can move one of the attribute points you gained at level 4, 8, or 12 around. You must still satisfy all the prerequisites for all your feats after the swap. Confusion: Roll 1d4: 1 – act normally, 2 – do nothing but babble incoherently, 3 – deal 1d8 points of damage + Str bonus to self with item in hand, 4 – attack nearest creature. d30: Once per session you can use a d30 instead of a d20. New Character: Use the same rule as for character death. Absent Players: Absent players ⇒ absent characters, no questions asked.